Stadium Park, spanning from 12th to 25th St. N.W., features 68 acres of nature and picnic areas, including a softball complex, playground, duck pond and a 1.5-mile rubberized walking track with exercise stations. The Canton Garden Center is also located within the park with an outside children’s garden. Adjacent to Stadium Park and next to the William McKinley Presidential Library & Museum is Monument Park, the site of the McKinley National Memorial. It includes picnic tables, grills and a large duck pond used for ice skating during the winter. Weis Park, on 25th St. N.W. behind the North Branch Library, features shuffleboard, bocce ball, tennis and volleyball courts and a baseball field. West Park Skateboard Park, on 9th and Shroyer Ave N.W., features many amenities for skateboarders, including a 4-foot quarterpipe and launch ramp. Westbrook Memorial Veterans’ Park, on 13th St. N.W., is the site of a U.S. Veterans memorial and a piece of the U.S. battleship Maine. Click here for more information, a full list of Canton City parks and park photos. Alpine Park, located at 3059 Alpine St NW, has a ½ mile jogging track, basketball court, tennis court, playgrounds and picnic shelters which can be rented at no cost to residents of Plain Township. Diamond Community Park and Sports Complex, located at the corner of Diamond Street and Middlebranch Road, has 42 acres of soccer fields, baseball/softball fields, a bocce ball court, .9-mile jogging path and a picnic pavilion. A large 80 by 160-foot complex on the grounds offers indoor sports and a community room, which can be reserved for individuals, businesses and groups for a free of $50 a day. Veterans Community Park. With land purchased in 2006, Veterans Community Park will be completed in phases. Phase I construction included a parking lot that accommodates a sled-riding hill, park shelter and dog park. This phase also included an ADA playground which allows children and adults to access the playground with any type of mobility device, a service Plain Township is able to provide thanks to a grant from the Ohio Department of Natural Resources. In addition, the Plain Township Parks system offers local sports programs for community soccer, midget football, baseball and softball. Other summer programs include baton/ pom-pom, bowling, humane society event, fitness classes, movie club and tennis lessons. Click here for more information. Owned and operated by Walsh University, this North Canton park exudes charm with its summer rentals, which include a cottage, kitchens, a western room, a pavilion and Hoover Hall. Perfect for family and group outings, all rentals include the use of playground equipment, baseball fields, a basketball court, a bocce court and a volleyball court. The pavilion is equipped with picnic tables, a large grill, electricity, a playground and roll-down sides in case of rain. Hoover Hall has a large stage with a dance floor, tables and seating, a kitchen and private restrooms and is perfect for banquets and weddings. Adjacent to the park is the Hoover Historical Center, the former summer home of Herbert W. Hoover, president of Hoover Company. For more information and a downloadable brochure, click here. The mission of the Stark County Park District is to acquire, preserve, and develop natural areas for passive recreation, conservation, education, and nature appreciation. Stark Parks includes 13 parks, 4 lakes, and over 80 miles of hiking, biking, and horseback riding trails around Stark County. Picnic shelters and indoor banquet and meeting facilities are available for rent. Hikes and nature education programs suitable for all ages are offered year-round, with on-line reservations available at www.StarkParks.com. The Stark County Park District features 13 parks and over 90 miles of hiking, biking, and horseback riding trails around Stark County. Picnic shelters and indoor banquet facilities are available for rent in several locations. Hikes, tours and nature education programs suitable for all ages are offered year-round, with on-line reservations available at www.StarkParks.com. Contact Stark Parks for more information on group tours and field trips. Sippo Lake Park, in Perry Township, features a beautiful 100 acre lake nestled between Canton and Massillon. The Sippo Lake Marina, 5300 Tyner St. NW, accessible off of Perry Drive, offers food, bait, and boat rentals from May-October. A clubhouse, picnic facilities, fishing piers, and a boat ramp for boats under 10 HP are also located near the Marina. The west entrance off of Genoa Ave. is the site of the wildlife rehabilitation center and park trails. The Exploration Gateway at Sippo Lake Park at 5712 12th St. NW, Canton, includes the Congressman Ralph Regula Canalway Center, the Lily Pad Gift Shop, access to hiking and biking trails, and a picnic shelter. Indoor banquet and party rooms at the Exploration Gateway are perfect for wedding receptions, formal events, reunions, business meetings, trade shows, birthday parties and other special events. Visit www.StarkPartyHall.com for rental information. Walborn Reservoir, 11324 Price St. NW, Alliance, provides the perfect escape for horseback riding, hiking, fishing, canoeing, and kayaking. Canoes, kayaks, motor boats, and row boats can be rented and beverages and snacks can be purchased at the Walborn Reservoir Marina from May-October. A boat ramp for boats under 10 HP is located next to the marina. A covered picnic shelter overlooking the shoreline of Walborn Reservoir may be rented to accommodate groups of up to 70 guests. Deer Creek Reservoir, 14514 Price St. NE, Alliance, is a 300-acre lake surrounded by forest featuring an accessible fishing pier, a boat ramp for electric motors only, picnic tables and grills, and a trailhead for the 4.46-mile Mahoning Valley Trail. Petros Lake Park, 3519 Perry Dr SW, Canton, features a 1.2-mile shore-side trail and a butterfly/wildflower trail. It also includes a fishing lake, picnic areas, volleyball court, ball fields and a walking/jogging track. Frank Esmont Park, 194 Mill St. SW, Canton, features a loop trail along the Nimishillen Creek. Cook’s Lagoon, 1819 Mahoning Rd. NE, Canton, provides a small natural retreat from the surrounding urban landscape featuring a small fishing pond and a short walking path. Fichtner Park, 12833 Market Ave N, Hartville, includes a hiking trail, pond and wetlands. Magnolia Flouring Mills, 261 Main St., Magnolia, is a 4.97-acre that includes a segment of the Sandy & Beaver Canal behind the mill, the water rights for the canal, and Dam #6. Built in 1834 and added to the National Register of Historic Places in 2000, the five-story Magnolia Flouring Mills preserve the history of the small town, agricultural communities of rural Stark County. Visitors to the mill will see a variety of milling techniques and equipment from the late 19th and early 20th centuries. Locally milled cornmeal, birdseed, animal feeds, and farm products can be purchased. Whitacre Greer Park, 4290 Irish Rd. N.W. in Magnolia, is a 2,000-acre park with approximately 6 miles of trails reserved for horseback riding only. The Ohio & Erie Canal Towpath Trail in Stark County provides 25 miles for hiking and biking, and more than 19 miles of horseback riding. The Stark County section is part of the 80+ mile Ohio & Erie Canalway National Heritage Area that connects Cuyahoga, Summit, Stark, and Tuscarawas counties. Begin your adventure at one of the 13 trailheads along the Stark County portion through the former canal villages of Canal Fulton, Massillon, and Navarre. Enjoy picnicking at Lock 4, Lake Avenue, John Glenn Grove, or Craig Pittman trailheads. The Hoover Trail through North Canton connects Washington Square, Hoover Park, Hoover High School, the North Canton YMCA, and North Canton's baseball fields. 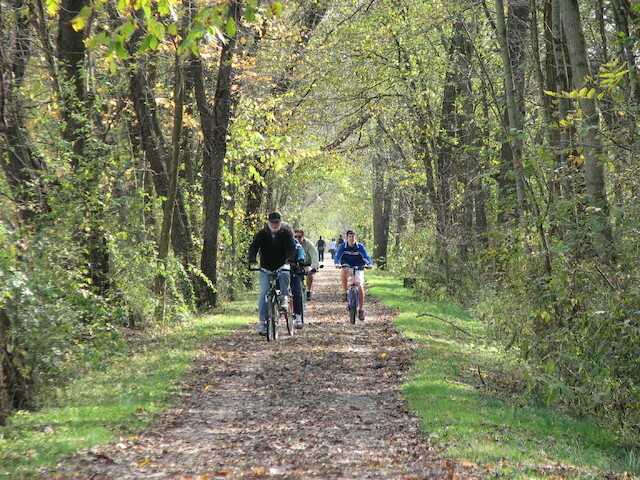 The Middle Branch Trail connects Canton City Parks including Robert E. Schreiber Park, Reifsnyder Park, Oak Park, and Martindale Park. The trail continues north along the railroad tracks then meanders through Gervasi Vineyard, Rice's Nursery, and High Mill Church of the Resurrection. The trail then loops around Schneider Park, continues north across Schneider Rd. and loops around GlenOak High School. The West Branch Trail follows the West Branch of the Nimishillen Creek and connects West Park, the former Mother Goose Land, Waterworks Park, Monument Park, Stadium Park, Ink Park, and Covered Bridge Park. Quail Hollow is located in Hartville about a half-hour from Canton and offers camping, trails, tours, fishing, picnicking, and nearby attractions. In the winter, cross-country skiing and ice skating are available. The park surrounds a beautiful 40-room manor and gardens and was originally the home of Harry Bartlett Stewart, CEO of the Akron, Canton and Youngstown Railroad in the early 1900s. For more information on the Stark County Park District, visit their website at www.StarkParks.com. Visitors can choose to travel by train, trolley, bike, bus or foot through the Canalway to discover museums, historic sites and outdoor recreational opportunities. The 100-mile Towpath trail is great for hiking, walking or bicycling, or you can choose to take in the scenery along 110 miles of scenic byway roads. The trail has dozens of trailheads linking cities and towns all over Ohio. The Cuyahoga Valley Scenic Railroad offers adventures through the Canalway to the Village of Peninsula, Hale Farm & Village, National Inventor’s Hall of Fame, Stan Hywet Hall & Gardens, Akron Zoo, Canton and Cuyahoga Valley National Park. Tours are also available by bus, trolley and The Saint Helena III canal boat to Canalway attractions such as historic sights and museums. Click here for more information. Located in Wilmot, OH, just a short distance from Canton, The Wilderness Center has miles of trails and many learning opportunities. As a non-profit center, TWC hosts numerous programs like walks, starwatches, planetarium shows and other special events like a concert series. Most are free and open to the public. The Interpretive Building includes a fossil wall, interactive display room, trails and animal observation area. Click here for more information. Cuyahoga Valley National Park, on the National Register of Historic Places, offers recreational activities, educational programs, railroad excursions, historic points of interest and conference facilities. Located on nearly 33,000 acres between Cleveland and Akron, CVNP can be accessed off I-77, I-271, The Ohio Turnpike (I-80) and State Route 8 by following park signs. The backbone of the park is the 22-mile Cuyahoga River, named “the crooked river” by American Indians. The steep valley walls, ravines and lush forest that merge the Appalachian Plateau and Central Lowlands give the park its beauty while also providing the perfect habitat for over 900 plant species and hundreds of animals. Visitors can choose to take a ranger-guided tour or explore the park on their own. Many events take place at the park, including concerts, art exhibits, workshops and shows. In addition, the park connects to the Ohio & Erie Canalway and Cuyahoga Valley Scenic Railroad. For more information about the CVNP click here. On more than 500 acres, visitors of Clay’s Park in Canal Fulton can choose from a number of activities such as camping, skating, swimming, water slides, volleyball, miniature golf, boating, biking/hiking trails and more. Within the park are an individual water park, skate park and RV park. Campers can rent cozy cabins and a restaurant on the grounds offers themed weekends, catering and an internet coffee café. Clay’s Park is great for family or company outings. A large amphitheater hosts concerts and special events during summer and fall, some of which are nationally recognized. Click here for more information. Just 7 miles south of Canton, Bear Creek offers camping, swimming, fishing, boating, miniature golf, ATV and bike trails, hayrides, horseback riding, day camps and winter tobogganing. Cabins and lodge rentals are available, and many events and themed weekends are planned each year. Click here for more information. Often referred to as the “Emerald Necklace,” Cleveland Metroparks consist of 16 reservations on more than 21,000 acres circling Cleveland. Each reservation offers its own recreation, education, events and distinct charm. The parks have many opportunities, including more than 60 miles of paved trails available for hiking, biking or skating. Seven golf courses are also owned and maintained by the parks. The Cleveland Metroparks Zoo offers many opportunities and exhibits for all ages.